More days than not feel as bleak as stale bread nowadays. The world is melting, burning down and drowning at the same time, species are disappearing, fascism is still well and alive, and sexual assault is everywhere from our screens to our schools, to the highest court in the most influential nation in the world. Falling into despair and giving up might feel like a warm bath after a lo(oooooooo)ng day: soothing and a great way to escape from reality. But just like taking baths too often and for too long, it's neither good for you nor the future of the planet, plus you'll come out all wrinkly. We need to keep fighting for ourselves, for the planet, for the future, and for the ones who don't have the power or the privilege to do so. Believe me, I get it: it's hard to feel hopeful and to keep on going sometimes, but we don't have another choice. The world is not doing great at the moment, but arguably, it's also never been better. We tend to focus on the bad, and rightly so since it's often urgent, instead of the good; but lest we forget, we have come a long way when it comes to the state of the world. We've made remarkable progress when it comes to decreasing the number of child deaths. In 1990, 1 in 11 children died before reaching the age of five; in 2017 the number decreased to 1 in 26. That's more than 50 percent. Despite the drop in mortality rates, 5.4 million children under the age of five died in 2017 and about half of these deaths occurred in Sub-saharan Africa. We still have a long way to go, but we also have proof that we can indeed save more lives. In 2000, Internation Labour Organisation (ILO) began monitoring child labour worldwide and in 2007 it set out to eliminate worst forms of child labour by 2016. Unfortunately even now, in 2018, this goal is not still completely met. But before you go back into the bath, in the 16 year period between 2000 and 2016 the world saw a net reduction of 94 million in child labour and more than 50 percent reduction of children in hazardous work. Like many other things in life, girls need to overcome more hurdles compared to boys when it comes to access to education. According to the UN, there are still 131 million girls out of school worldwide. As unimaginably large as this number sounds (and is), the number of girls who are currently in school is much larger compared to what it used to be. According to data gathered by UNESCO, the net enrolment rate in primary education for girls has increased 25 percent in the past 40 years and is now almost at 90 percent. In 1893, New Zealand was the first country (self-governing colony) in the world in which all women had the right to vote in parliamentary elections. In 2018, Vatican City is the only country women are not allowed to vote since only cardinals can vote in a papal conclave and women are not allowed to be cardinals. However, let's not forget, just because women are technically — legally — allowed to vote doesn't mean they freely can everywhere in the world. In some countries, it is still quite difficult for women to exercise this civil right. 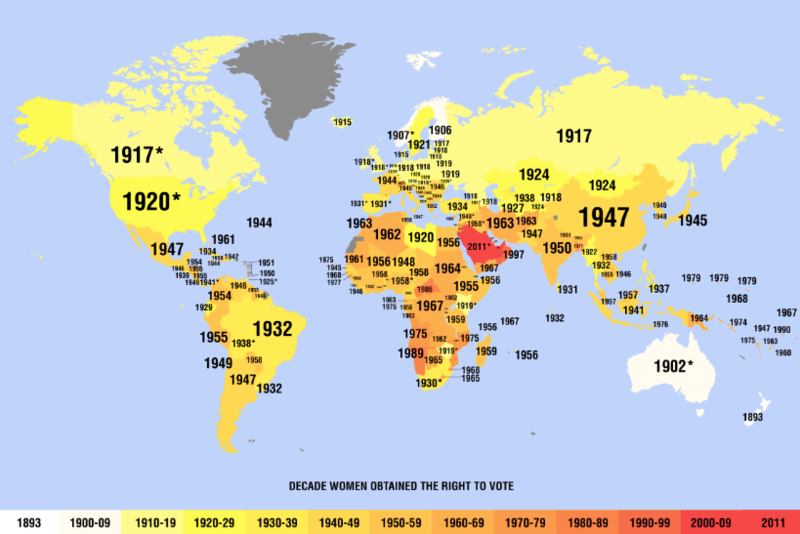 Below, you can see a map showing what year women gained the right to vote by country. 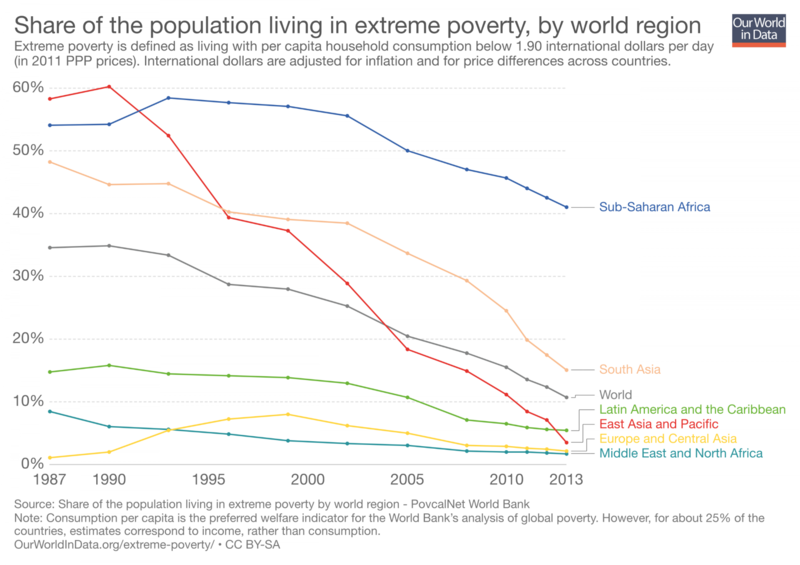 Since 1987, there has been a large drop in global extreme poverty. Between 1987 and 2013 rates have dropped from 35 to 11 worldwide, from 54 percent to 41 percent in Sub-saharan Africa, from 15 percent to five percent in Latin America, and a whopping 54 percent (58 to four) in East Asia. Along with global extreme poverty, world hunger is also decreasing. According to the International Food Policy Research Institute's Global Hunger Index (GHI), the share of the population that is undernourished went down 5.4 percent between 1999-2001 and 2014-2016. In 2017, there were only four countries facing famine: Nigeria, Somalia, South Sudan, and Yemen. 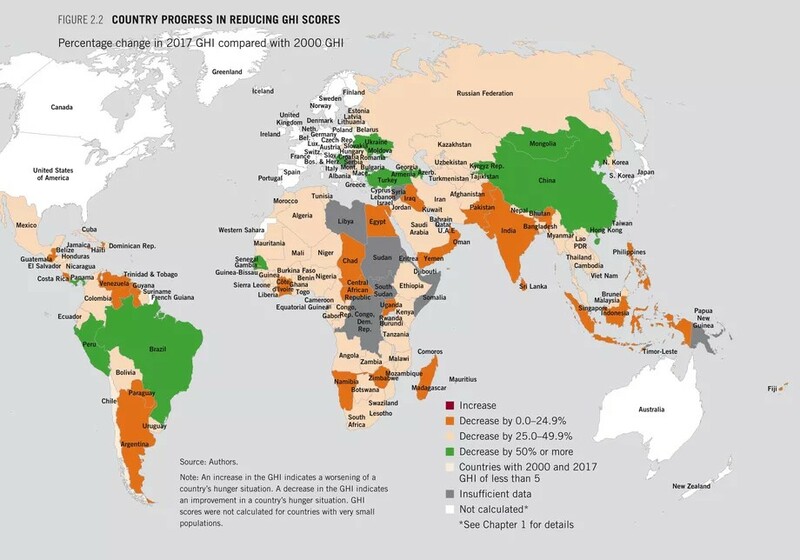 The map below shows the increase and decrease in hunger in countries included in GHI. The prevalence of green and light orange and the lack of red is encouraging. The numbers and graphs above are a testament to the importance of research and information in our fight for a better, fairer, and more livable planet. Human Rights Watch is an organisation that conducts research about violation of human rights all over the world and shares the results with the public and with policymakers. If you want to support the organisation in their efforts to advocate for equality for all, you can donate to them below.